Cramlington CHP — Estover Energy Ltd.
Estover's £138m 27.7MWe biomass CHP plant in Cramlington, Northumberland was financed in September 2015. £48m of equity was committed by John Laing Group plc and the UK Green Investment Bank plc alongside £90m of debt from Barclays Bank plc, with an export credit guarantee from EKF. 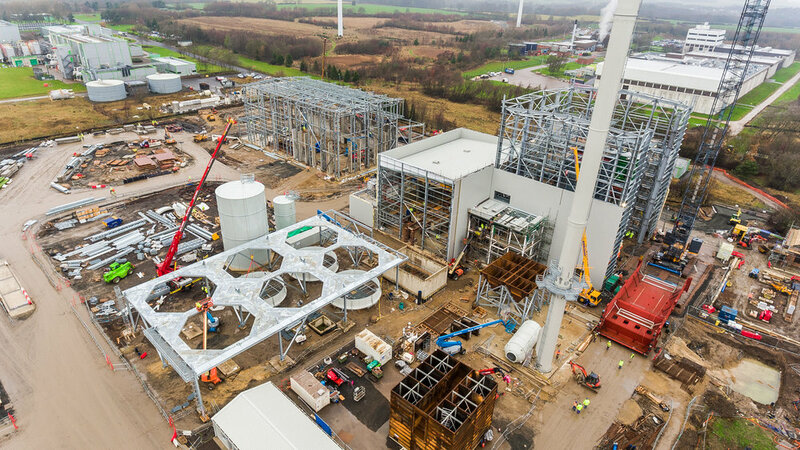 The plant will supply electricity and heat to Aesica Pharmaceuticals and MSD, two of the largest employers in the North East's highly successful specialist pharmaceutical cluster. It will also supply low carbon electricity to the National Grid. Enough electricity to power 52,000 homes, reducing greenhouse gas emissions by the equivalent of taking 25,000 cars off the road per year. Estover is retaining an equity stake in the project, and a 12-year contract to provide ongoing general management, project & construction management services, as well as fuel management services for the project.